We Wanted to be Writers is a rollicking and insightful blend of original interviews, commentary, advice, gossip, anecdotes, analyses, history, and asides with nearly thirty graduates and teachers at the now legendary Iowa Writers' Workshop between 1974 and 1978. 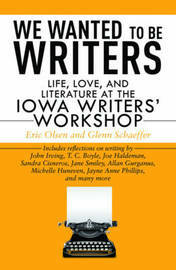 Among the talents that emerged in those years-writing, criticizing, drinking, and debating in the classrooms and barrooms of Iowa City-were the younger versions of writers who became John Irving, Jane Smiley, T. C. Boyle, Michelle Huneven, Allan Gurganus, Sandra Cisneros, Jayne Anne Phillips, Jennie Fields, Joy Harjo, Joe Haldeman, and many others. It is chock full of insights and a treasure trove of inspiration for all writers, readers, history lovers, and anyone who ever "wanted to be a writer." Jane Smiley on the Iowa writers' workshop: "In that period, the teachers tended to be men of a certain age, with the idea that competition was somehow the key-the Norman Mailer period. The story was that if you disagreed with Norman, or gave him a bad review, he'd punch you in the nose. You were supposed to get in fights in restaurants." T.C. Boyle on his short story "Drowning": "I got $25 for it, which was wonderful . . . You know, getting $25 for the product of your own brain? You could buy a lot of beer in Iowa City back then for that."